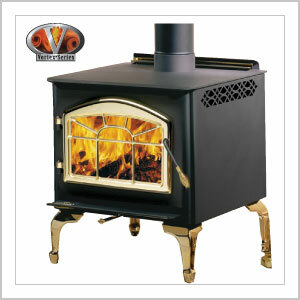 This highly efficient 1100PL leg model wood burning stove has not only the looks, but also provides a large amount of reliable heat which can be easily regulated by the unique lever burn control. Napoleon's air wash system compounded with high temperatures help maintain the viewing glass clean so you can consistently enjoy the cozy and warm wood burning flame. The 1100PL is shown with 24 karat gold plated webbed arched door and decorative cast iron legs.